Lake Forest, California, which was just incorporated in 1991, has grown to over eighty thousand residents. Prior to that year, it was known as El Toro since the 1880’s. Lake Forest is home to some nationally known companies including Oakley, the eyewear company, metals company, Kaiser Aluminum, Panasonic Avionics, Karem Aircraft, Barbeques Galore, Johnny Rockets, and Del Taco, to name just a few. There are just over sixty-seven hundred companies located in Lake Forest, CA, and every day, new and exciting business ventures are being started. No matter what particular area of business your company is engaged in, such as a professional consultant, website designer, product manufacturer or distributor, app development, the technology field, health care field, e-commerce, retailer, entrepreneur-startup, the construction industry as a General Contractor or as an artisan/sub-contractor, communications field, or one of the many unique and different companies that call this city home, our professional and experienced brokers at PJO Insurance Brokerage can help you secure the proper insurance program for your company’s particular needs. An area of business that has just exploded over the past decade or so has been in the area of the Professional Services Sector in such diverse areas as Management Consultant, Media Consultant, Project Manager, Architect, Home Inspection, Technology Field, App Designer, Website Designer, Accountant/CPA, or Healthcare Sector, among the numerous companies in Lake Forest, CA which provide professional services for a fee, give advice, or provide expertise, then it is extremely vital that your company carry the proper insurance limits of Professional Liability Insurance Coverage should the unthinkable happen to your company such as a lawsuit or claim being filed for an error or omission or a negligent act performed by your company which caused harm to your client. PJO Insurance Brokerage has access to numerous “A” rated carriers and can help you find the proper insurance coverage for your California company’s professional insurance coverage needs. If your Orange County based company has a Board of Directors, we highly recommend that it would be in your company’s best interest to provide protection for your board members by having Directors & Officers Liability Insurance Coverage in case a claim should be filed against the board of directors for any actual or alleged act, misleading statement given, omission, or breach of duty by your company’s board of directors and officers. A Professional Liability Insurance Policy can be utilized by nonprofit companies, for-profit companies, or educational institutions. An area of business that has also seen quite a bit of growth over the last few years has been that of a Product Distributor, Manufacturer, or Manufacturer’s Rep. Some of the numerous product areas are food products, energy products, healthcare/medical products, technology products, snack products, dietary products, or one of the many unique products that are sold and marketed across the world daily, and one thing that is very important concerning all products is having the proper amount of Product Liability Insurance Coverage, and if there are higher risks associated with the product, additional layers of protection, called an Umbrella/Excess Liability Insurance Policy, would be wise to add to your coverage. PJO Insurance Brokerage has access to several “A” rated insurance carriers, and, in most instances, can create an insurance program that is designed to fit your company’s specific products’ needs. If your Lake Forest, CA company is in the construction industry, whether that would be as a General Contractor in the area of new custom homes, commercial tenant-improvements or new builds, renovation or remodel projects, performing restoration projects, or doing tract or development work, or your company is acting as an artisan/sub-contractor like a Plumbing Contractor, Electrical Contractor, Carpentry, Framing Constructor, Painting Contractor, Drywall Contractor, Concrete Contractor, Roofing Contractor, Masonry Contractor, just to name a few of the artisan trades there are, regardless of whether the work is residential or commercial, you know how important it is to have the proper insurance program. Equally important, you should also want to work with an insurance agency which has years of experience working with contractors and understands what their insurance needs are, and that agency would be PJO Insurance Brokerage. Our experienced brokers work with numerous insurance carriers who handle the construction industry with such coverages as General Liability Insurance, Workers’ Compensation Insurance, Pollution Liability, Umbrella/Excess Liability Policies, Property and Inland Marine, to name just a few of the coverages that are available for the construction industry. As most contractors will tell you, it’s very important to have the proper insurance coverage in place should a claim or lawsuit be filed against your company. Also, if there is one thing that almost all companies have in common is that they have some sort of media presence, whether that would be an Instagram Account, a Twitter Account, Company Webpage, Facebook Page, LinkedIn Page, or Company Blog , among the many possibilities, and all of these can pose a serious risk to your company. If your California company collects vital customer information, medical records, social security numbers, or debit and credit cards, we suggest your company acquire a Cyber Liability Insurance Policy as part of your insurance program. Consider the amount of news reports that come out each month about another company’s information being leaked to the public due to it being hacked. 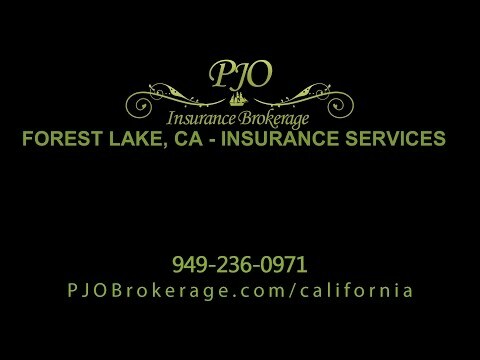 Each new day in Lake Forest, CA, someone takes that first step and starts their own company or develops plans to make their current company bigger, and, as they say, no two companies are the same, and neither will their insurance needs be, and that’s why we feel PJO Insurance Brokerage can be a benefit to your company. We would welcome the opportunity to work with your company in the near future.